Father’s Day is right around the corner, and I think Dads are getting the short end of the stick. I don’t see restaurant adverts to book Father’s Day Brunch reservations. I am not seeing the flower guys on the street corner waving dad gear around for $20 bucks a pop. There’s not a campaign to bring Dad in for a mani-pedi. Hand him a 6 pack and let him be. What gives? A pop is just as important and needs to be reminded from time to time. So, GirlCarnivore, your trusted ambassador to all things meaty teamed up with Saber Grills and several other like-minded blogging pro’s for a special giveaway just in time for the Best Dad. Rapid pre-heat (0-700 degrees in 10 minutes) and no flare-ups make Saber grills SMARTER. 304 stainless steel and top quality construction ensure Saber grills are STRONGER. Saber grills use a full 30% less fuel, make Saber the performance LEADER. That’s right, Saber grills pretty much rock. And today, with #BetterFathersDay you can enter to win one Saber Cast 500 Grill! In a large pot with 4 quarts of cold water, stir in the sugar and salt until dissolved. Place the ribs in and keep cool for 1 hour. Remove and pat dry. *Tip: don't have the space in the fridge? 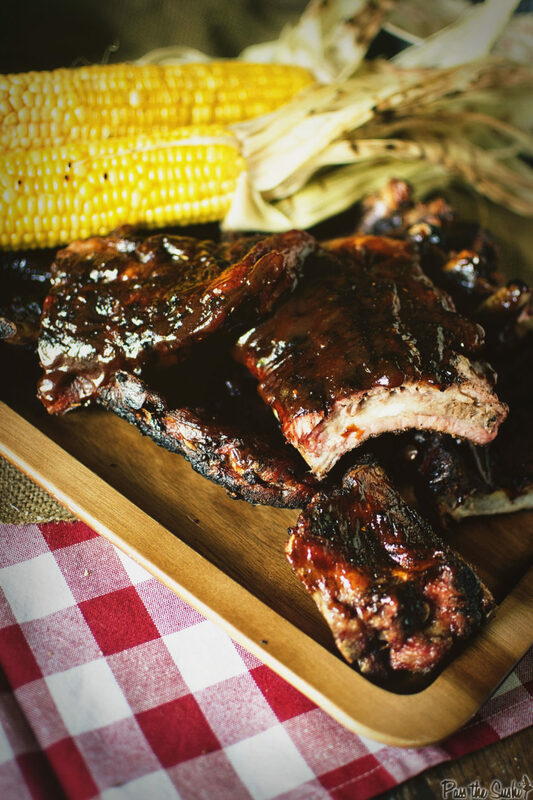 Line a large cooler with ice and place the liquid in a heavy duty - CLEAN - plastic bag and toss the ribs in those. This will do for an hour. In a bowl, toss all of the rub ingredients together and thoroughly rub down the ribs 1 tbs per side. Place on a baking sheet and in the fridge for 30 minutes. Meanwhile, heat that grill up. Put the soaked wood chips in a small aluminum pan, or make one with a few sheets of heavy duty aluminum foil. Carefully place the pan with the wood chips over the main burner and turn all the burners to high. Heat the grill with the lid closed for at least 15 minutes. The wood should be heavily smoking. Scrape the grates clean and oil them before tossing the ribs on. Leave the primary burner (the one with the wood chips) on high and turn the others off to create an indirect heat source. Place the ribs on the cooler side of the grill and cook for 4 hours (heat should be about 275) with the lid closed, flipping every 30 minutes. 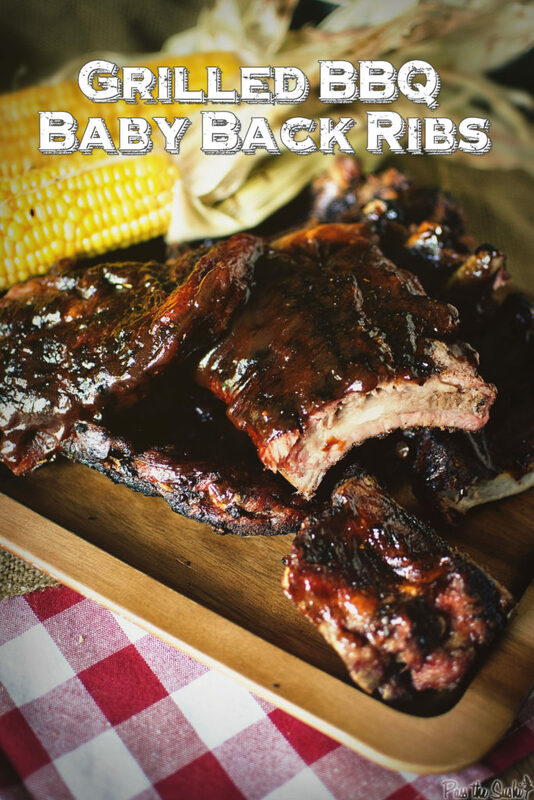 Transfer the ribs to a cutting board and slice between the bones for serving. Charcoal Grill? No problem If you are brave enough to try this on a charcoal grill, go for it! It produces a wonderful smokey flavor. Heat the grill to between 275 and 300 with the bottom vent all the way open for air. Once those coals are nice and hot, build a pile on one half of the grill, leaving the other half empty. Cook the ribs for 2 hours, flipping every 30 minutes. The temperature will have dropped on the grill to about 250. Carefully add about 10 fresh charcoal briquettes and continue to cook for another 1/2 to 2 hours. Careful to watch that heat and any possibly flair ups. 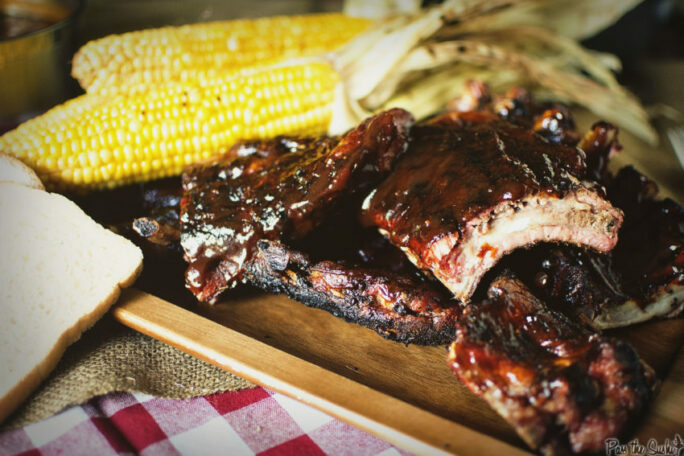 Blog: Better Barbecue Blog For recipes, grilling tips and more! Saber Grills sponsored this post and therefore #ad, however as always, the thoughts and opinions expressed in this post are my own. Grilling rocks and Dad’s (and the whole family) deserve kicking grilling equipment. Entry Conditions For All Prizes. 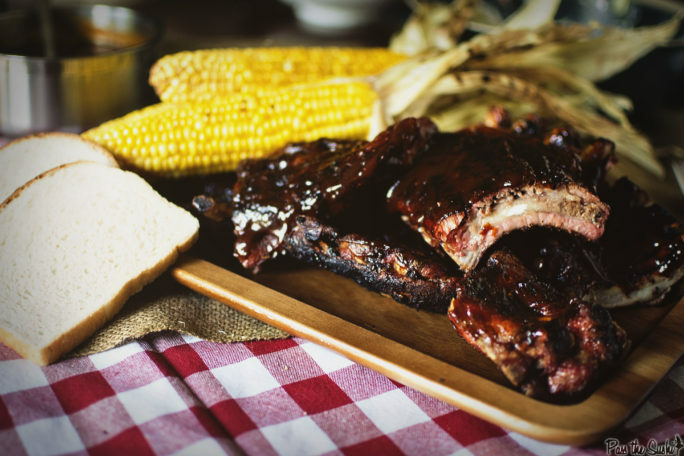 Here are more mouth-watering recipes ideas for for your Father’s Day Barbecue (or any barbecue) from some of my foodie friends. 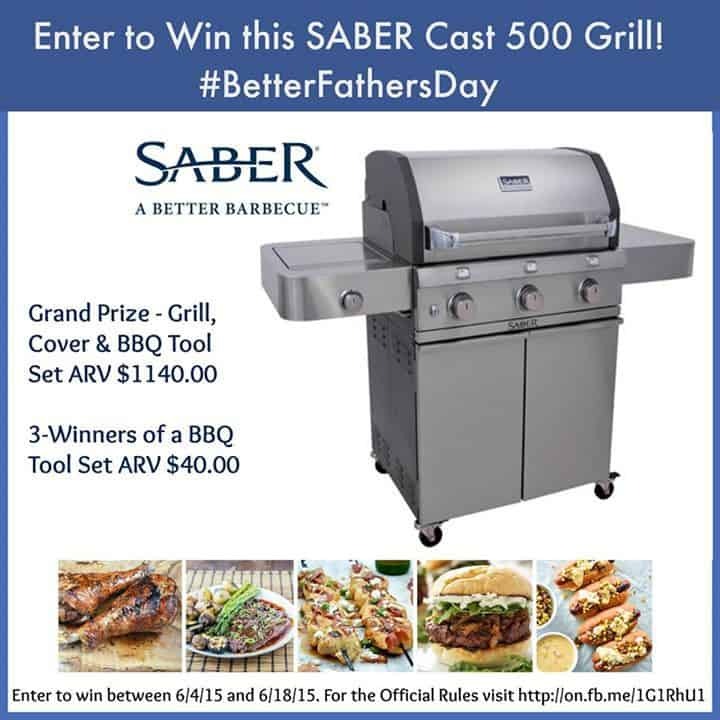 Plus gain additional entries for our #BetterFathersDay Saber Grill Giveaway by commenting on their recipes. Damn girl! I am drooling! You know, I have never brined my ribs…I’m going to have to try it and see if I taste a difference…curious now, thanks! I think that I NEED this Saber Grill in my life and I NEED those ribs too! What a great looking grill I’d love to win for my son-in-law! That’d look great on the back deck! These ribs look legit! I’m on the market for a new grill before summer. I’ll have to check out the Saber Grills. wait but I’m not a dad and I want all these things! However I’m pretty sure my dad would be very happy to sit down in front of these ribs too. Oh my gosh yes my dad is in desperate need of a new grill! This recipe of course is awesomeness and I would definitely have to try it with my dad on this baby. The SABER Cast 500 Grill sounds like such an awesome grill! Would love to try one! I think the recipe is a good one too – brining meat first always produces a juicy result. And, you just can’t go wrong with a recipe from the Cook’s Illustrated folks! I Love The SABER Grills, Sleek Modern Designs, The Baby Back Ribs Recipe Looks Delicious! Hi Michael, how many burners are you running on your grill?